Approximately 4km outside Basra International Airport, lies an exposed, sandy parking lot, slightly recessed from the lay of the land, like a giant golf bunker. It’s known as the dustbowl. The dustbowl is routinely filled with armoured vehicles, heavily armed security personnel, and the taxis that are the only form of transport to and from Basra International. In effect, it is a primitive transport hub, where Western contractors are coupled with their security, decked out in bullet-proof body armour, and loaded into the vehicles that will take them to their destinations. In Ian Fyall, Simian Overseas Managing Partner’s case, that destination was Majnoon oil field. Majnoon, in Southern Iraq is one of the richest oil fields in the world. 60km from Basra, it boasts an estimated 38 billion barrels of oil. After the devastation of over 30 years of conflict, oil is the only way that Iraq will be able to put itself back on its feet, and Majnoon will have a major part to play. By 2020, the Iraqi government aims to produce 7 million barrels of oil per day. To achieve this, Majnoon will have to contribute 1.8 million barrels per day. The scale of this field really is breath-taking. It’s no wonder that Majnoon translates as “crazy” in Arabic. Majnoon has been under the control of Shell since 2009, in a joint deal with Petronas and the Iraqi government, one of 10 major oilfields offered for development by foreign consortiums in an effort to get them running again as quickly as possible. However, the government have always been keen to get local workers onsite. This appeals to a development consortium, since employing Western tradesmen is a costly endeavour. In 2012, there were Iraqi scaffolders available, the problem was, they had received little or no formal training. Health and safety was not a consideration, and their ability to carry out their day to day tasks correctly and safely was severely lacking. Simian were first contacted about the potential need for scaffolding training in Southern Iraq in 2011. At that point the US was in the process of withdrawing troops, but the country was anything but stable. Violence was still an everyday occurrence, and foreigners were viewed with suspicion and mistrust. It was a dangerous place to do business, but it was a country that desperately needed to rebuild, and Simian were eager for the challenge. Lee Standring, Senior Supervisor, was the first Simian representative to work full-time in Iraq, arriving at Majnoon in 2012. Although the military extraction was complete, Iraq was still a dangerous place, mortar attacks were a common occurrence. “Being slightly naïve was probably the best way to go in,” he says, “it meant I didn’t allow myself to think about the worst that could have happened.” Standring was used to working in challenging environments, and starting training from the basics, having previously worked as a scaffolding trainer for Simian in Oman and Dubai, but even he was shocked at what he found when he got to Iraq. The knowledge, equipment and health and safety of the Iraqi workers was worse than he was expecting. According to Standring, there was simply no awareness of even the need for correct health and safety. The men stood in front of him on day one in flip flops, openly smoking on one of the world’s biggest oil fields. Very quickly, the steel toecap boots were put on, and the cigarettes were put out. The equipment that the men were using, and Standring was expected to use to train them, was, he soon found, not up to the job. The scaffolders’ personal tool boxes were non-existent, “I had 30 men stood in front of me, and between them they had one spanner!” One of the first jobs to do was to dismantle the scaffolding that had been the cause of an injury to one of the workers, and had led to Simian’s involvement. Lee found that the tubes that had been used were bending under his weight, it simply wasn’t safe, he knew something had to be done about it. After some frank discussions with the bosses of the oil field, Lee convinced them to make considerable investment in equipment. Over $1.5m has since been spent on 1000 tonnes of quality scaffolding for Majnoon. It would be easy to wonder whether Standring wanted to run back to the airport and get the first plane back to the comfort of Dubai, or one of Simian’s other bespoke overseas training centres, but he says quite the opposite is true. Lee, and Simian, were excited by the prospect of building a project from the ground up, and seeing it through. Especially considering the reception that he had been given by the men themselves, who were warm, welcoming and, after 30 or more years of conflict, humble, and grateful for his help. Lee quickly became extremely fond of the men in his charge, who were simply trying to better themselves in order to provide for their large extended families. With so many people relying on the success of the project, he realised that he was carrying a lot of responsibility, “we can’t send them home hurt,” he determined. However, this training programme was going to be unlike any other that Simian had undertaken before. The need for practical skills as soon as possible meant that the usual timescales simply couldn’t apply. Lee would use the daily two-hour wait for the permits to come through as classroom time. Standing at the whiteboard, he would drill the facts and figures into the men, (literacy issues for many making rote learning the only option) asking and answering the same questions day after day until the information could be retained. Out in the field, Lee would show one man how to complete a task, before getting that man to show the next. By getting the men to work as a team, looking out for each other and with a collective sense of responsibility, the results would follow. He intended to keep his promise that over the course of the five-year contract, Simian would make them the best scaffolders in the whole of Iraq. Unfortunately, not everyone could complete the course. For example, one trainee, Haider Mohiee, who was there along with his brother Amjad was removed from site for his attitude towards health and safety. This meant that the 13 family members who relied on the brothers were now depending on one wage rather than two. Three months later, during trade tests for new scaffolders, one candidate stood out above the others. It was their younger brother Mustafa, who they had been teaching at home, educating him in the correct way to scaffold, to speed up his training, and restore the second wage. The legacy effect of the work being done by Simian was already apparent. 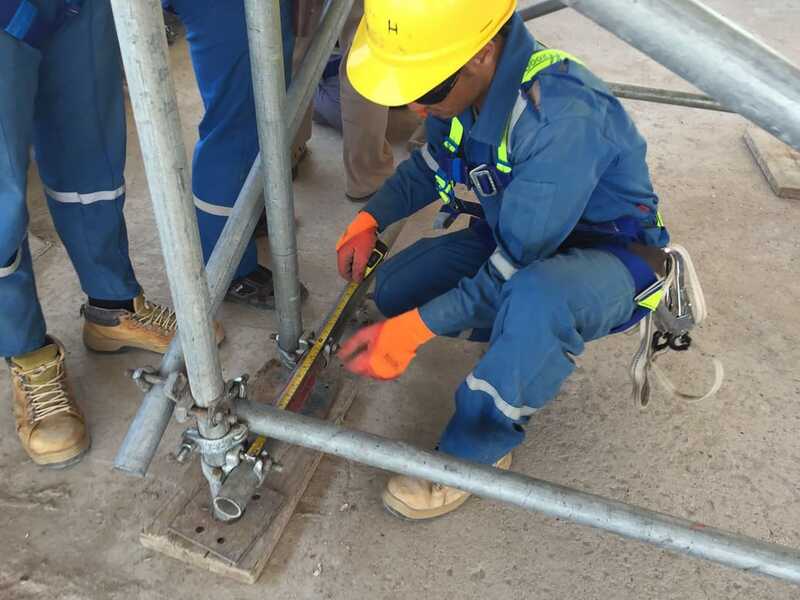 Gradually, the improvements could be seen, both in the trainees’ knowledge and capabilities as scaffolders, and in their respect for the necessary health and safety. By nurturing the relationship between trainer and trainee, the hard work and investment from Simian was bearing fruit. The men wanted to be part of Lee’s team, sharing food with him, even though they could barely afford to. 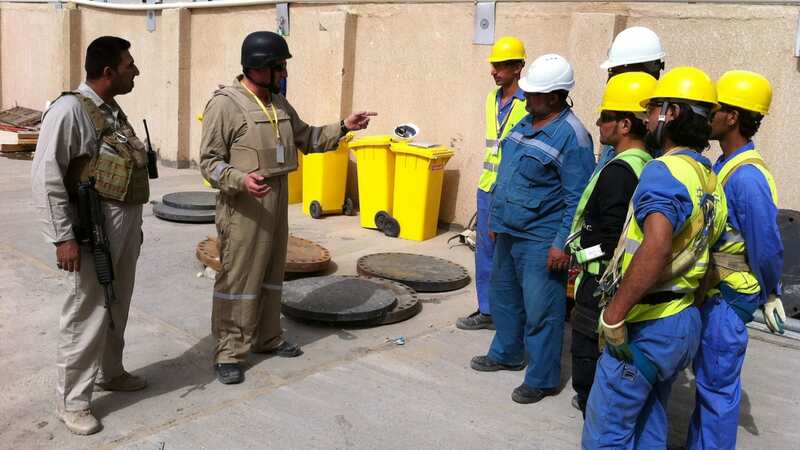 One of the key parts of the training process was complete honesty in the assessment of the workers. If they were not good enough, Lee would say so, despite being under pressure to get them working as soon as possible. Among the men was Salah, who struggled with the classroom elements, mumbling his answers and having difficulty retaining both written and practical elements of the training. He was a particular challenge for the trainers. 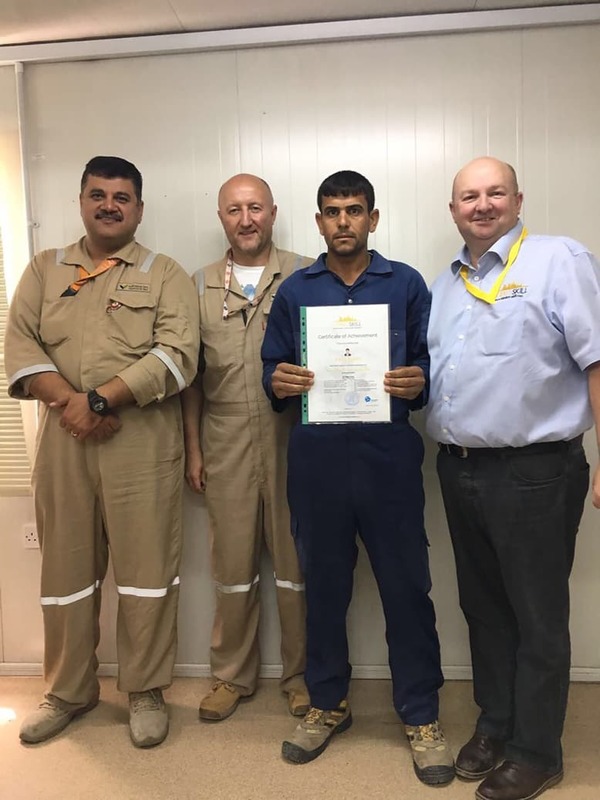 When Ian Fyall went to Basra in 2017, it was to present 30 men with the certificates signifying their status as fully trained and qualified scaffolders. Salah achieved his certificate alongside his colleagues. They are now able to stand on their own feet and deliver quality workmanship wherever they choose to work. The legacy of this training is most apparent on other sites, where the trained men are held up as the example of how to do things properly, their standard is the new benchmark in a country that until 2012 had no health and safety awareness or scaffolding training. 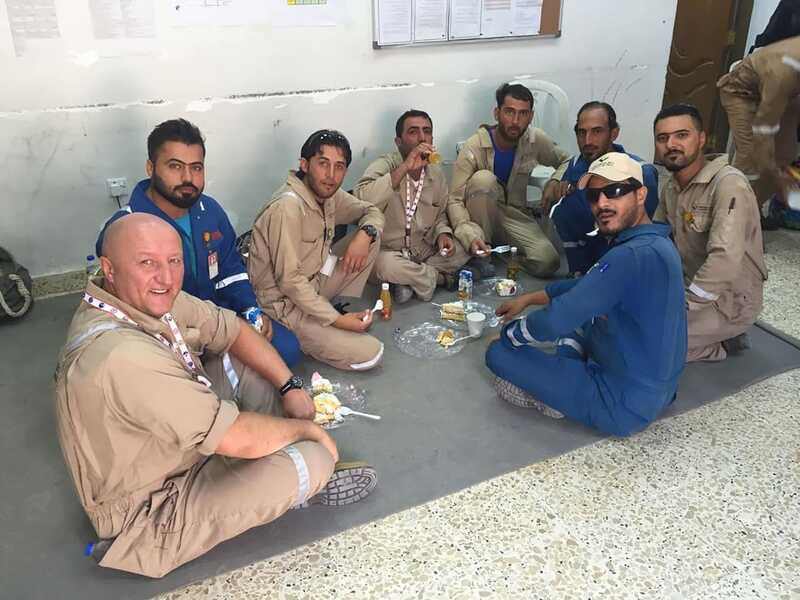 5 years, and over 500,000 injury and accident-free man-hours later, Simian is very proud of the trainees, and the multiplication effect of good training, safe practice and correct workmanship for the many Iraqi workers that will follow the success of this project.